Antiquariaat Acanthus heeft haar winkel in 2018 heropend, u bent van harte welkom om langs te komen. In ons aanbod hebben wij oude, zeldzame en mooie boeken op vrijwel elk gebied. Daarnaast fotografie, manuscripten, brieven, tekeningen, prenten, kaarten, posters, folders, papieren speelgoed en curiositeiten, etc. Uiteraard houden ons ook aanbevolen om bijzondere dingen aangeboden te krijgen en te kopen. Geopend vrijdags 11.00-18.00 uur; de andere dagen op afspraak. 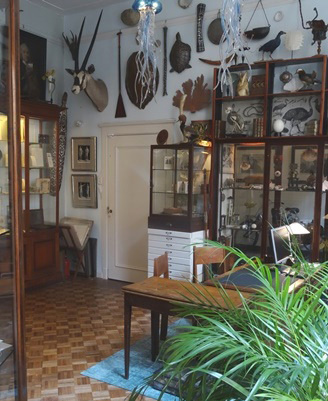 Acanthus Antiquariaat was founded in 1990 and offers rare, beautiful, and curious books, prints, and objects, in a wonderous venue, newly styled as a true cabinet of curiosities. We carry a stock of rare & antiquarian books and prints, including subjects like travelling, natural history, science, photography, avantgarde, illustrated books, fine bindings, optical toys, popular prints & broadsides, ephemera, objects of curiosity, and many more… in short, everything that we find interesting, beautiful, remarkable, or simply weird. We are open on Fridays 11 am – 6 pm and all other days by appointment. If you are travelling from afar, it is advisable to call in advance of your visit.